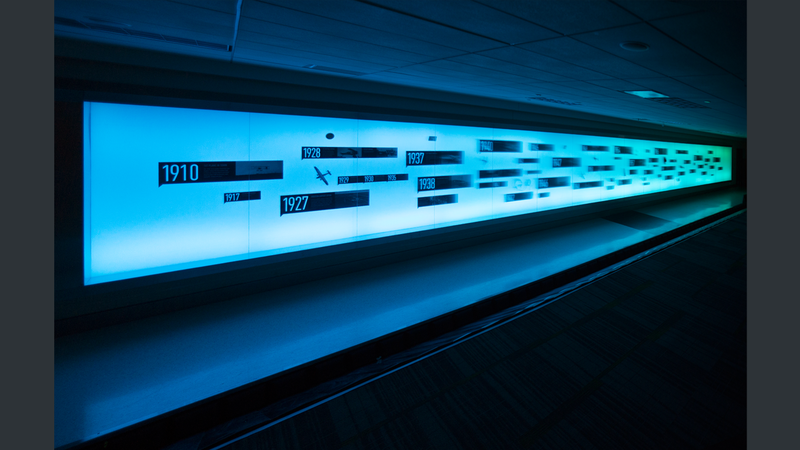 This dynamic art installation exists in Houston's Hobby Airport baggage claim. From a distance, the expansive wall of color-changing light serves as a bold and compelling piece of public art. 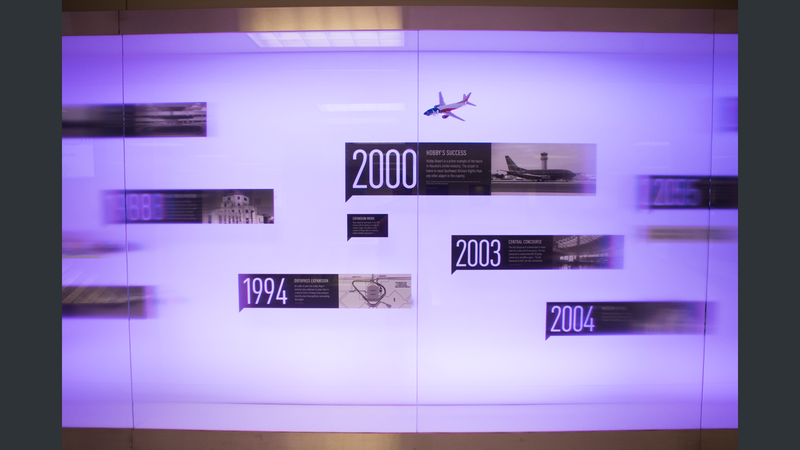 Up close, an interpretive timeline is revealed, which tells the 75 year history of the airport. The effect of a 'timeline in motion' is enhanced not only with the movement of the colored lights, which gracefully roll from one end to the other, but also from a specialized glass in front that is transparent when viewed from straight on, but increasingly blurred from longer angles. The distortion creates the effect of blur and motion. 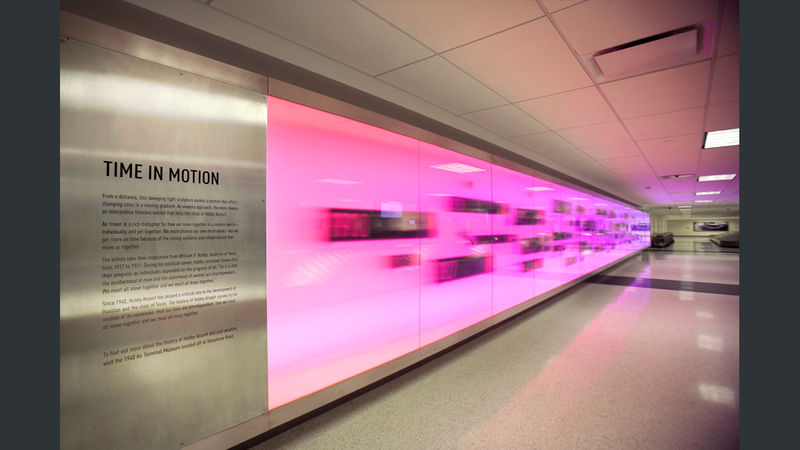 Color-changing LEDs roll along this 70' piece, increasing sense of motion with specialty blur-effect glass. 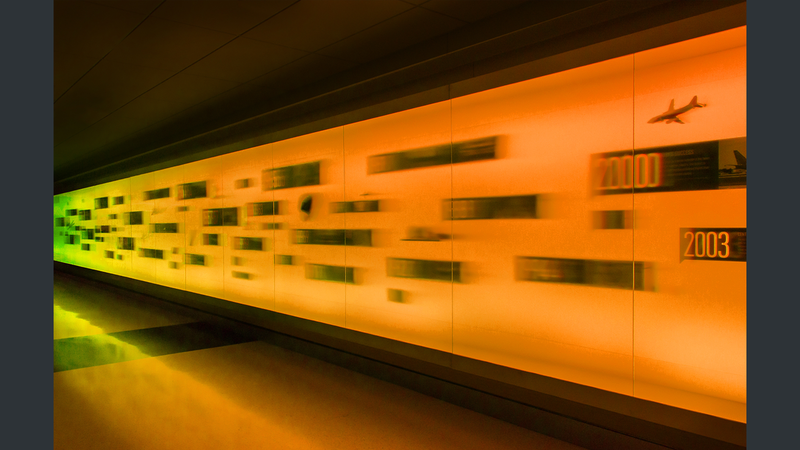 Combined effects invite visitors to move along the timeline. Three dimensional timeline artifacts meant the design team had only a 3" by 6' cavity in which to backlight the translucent backing. The visible section of this piece is nearly 70' long and 6' tall. 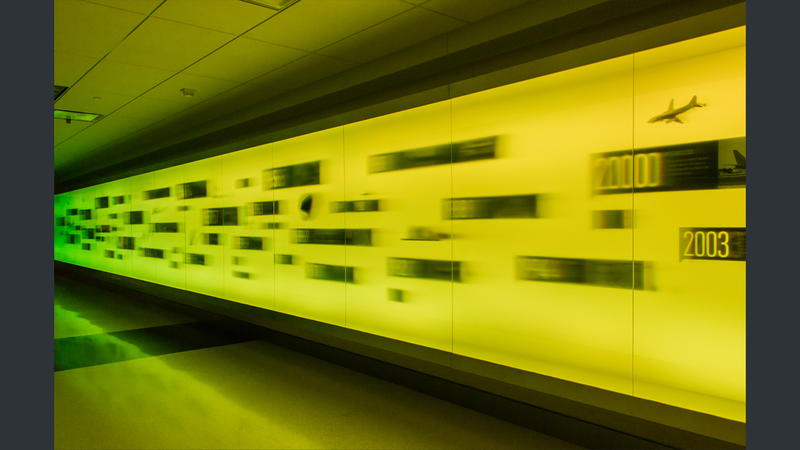 Behind the blurred glass, timeline elements are pinned off a translucent white diffuser wall, which is then backlit with linear LED lights. With the depth of the entire art piece totaling 16", a significant design challenge in trying to create this wall of color was getting an even wash within the 3" deep cavity allocated for the light fixtures. Several mock ups were conducted to ensure the correct specifications were chosen to fully illuminate the 3" by 6' cavity. Housed in a municipal facility, energy use and maintainability were of primary concern. 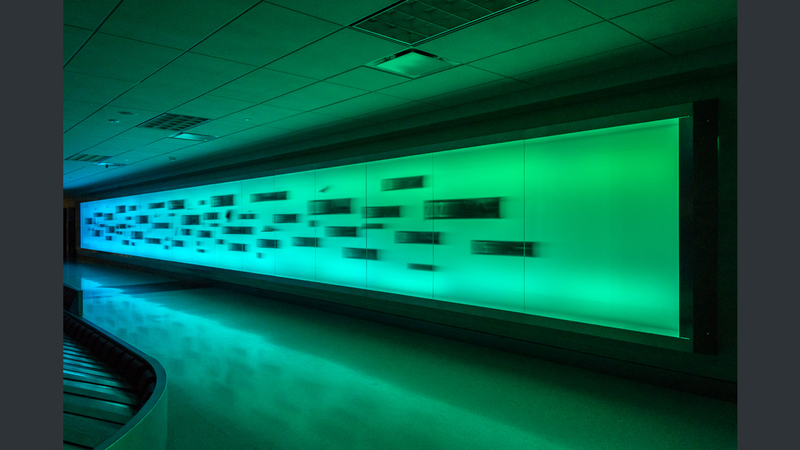 LED strips addressed both of these concerns while also providing the moving, color-changing aesthetics the artist desired. Very narrow beam spread linear LEDs, placed out of view at the top and bottom of the 6' piece, ensure the look of an even light panel. The color changing LED gracefully roll from one end to another. The result is an expansive, glowing art piece which is dramatic and eye catching from afar, yet becomes more compelling and engrossing as the viewer approaches and moves with the light across it. The rolling colors of light add to the art piece's theme of time in motion. 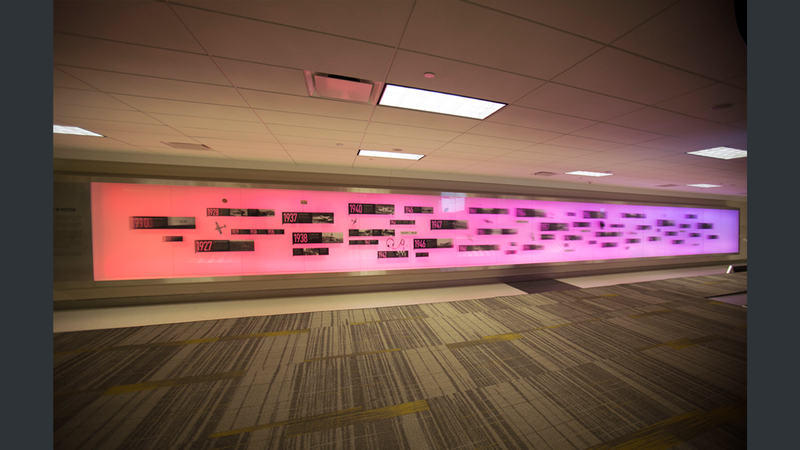 the 70 foot long wall of color is compelling when viewed across the baggage claim, yet the motion of light draws visitors in for up-close engagement.